Standing proud within an ancient 400 acre deer park, this magnificent Burges-designed property promises panoramic views across the World Heritage Site of Fountains Abbey and Studley Royal. Built in 1873, its name stems from the fact that it was originally a music school. Today it offers a spacious and unspoiled setting for up to 10 people to stay. The interior captures the Burges style, whilst also reflecting the historic setting of Studley Royal park: a continual home to herds of deer for the past 500 years. 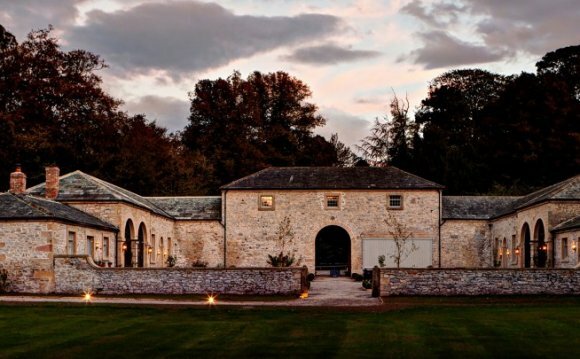 It is the perfect base for anyone looking to explore the spectacular surroundings of Fountains Abbey or slightly further-a-field destinations like York, The Dales and North Yorkshire Moors. There is a small enclosed lawn area to the front of the house, beyond that is the deer park, home to over 400 red, fallow and sika deer. Fountains Abbey, Studley Royal Water Garden and the Deer park have events to appeal to all ages throughout the year. Visit the web pages by clicking on the nearby tab, above, to see details of events, nature, walking and cycling trails when planning your holiday. Ground floorformal sitting room with open fire, casual sitting room, double bedroom with shower, dining room, kitchen, utility room and lavatory.First floorfour bedrooms (2 doubles- 1 with 5' bed and ensuite bathroom, 2 twins), shower room and bathroom with shower over bath. Garden: Small enclosed lawn to the front of the house. Parking: There is a large car parking area to the rear of the property. Please Note: As the house is situated within a deer park it is expected that you will find deer around the property, in the gardens and parking area. In October the rutting season is underway, and at this time when the stags are gathering together their 'harem' they become particularly vocal and the roaring, whistling and barking will be evident throughout most nights. A minimum notice of 7 days is required for all food orders. Pricing is as follows: Adults £6 per head / Children £4 per head. Please note side vegetables are not included. Casseroles or pies will be delivered to the cottage and left in the fridge ready for your arrival.